Believe it or not when learning how to hold a crochet hook you're the one who decides which method is best for you and your comfort! Now with saying that keep in mind there are several methods of holding a hook, and I am going to show the two most popular ways of doing so before you decide which technique works best for you. Now if you end up holding your hook a little differently than the two methods shown in this lesson... don't be afraid to just go with it! 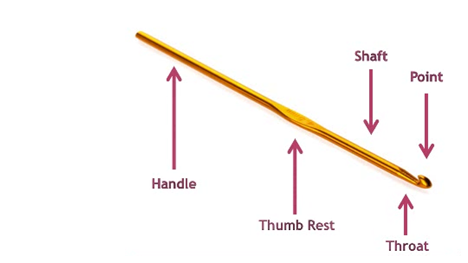 Before you learn how to hold a crochet hook the first thing you need know is where the hook's handle and thumb-rest (found in diagram below) are located. This way when I talk about hook placement you won't be completely lost. In the diagram below I also point out the hook's shaft, point and throat just in case you are interested! Tip: I hope I am not stating the obvious, but just in case you didn't already know the crochet hook is placed in your dominant hand. 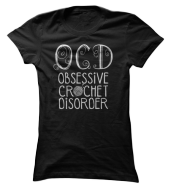 It is just like it sounds... hold your crochet hook the exact same way you hold your knife while cutting food. Make sure your thumb and middle finger are grasping the thumb-rest and the crochet hook's handle is resting against your palm. Look below at some entertaining pictures of how to hold your hook using the knife method - I hope they are entertaining at least! This method is also called the pencil method, but I personally like any terminology that deals with food a lot better. Hold your crochet hook the same way you hold your fork while eating. Make sure your thumb and forefinger are griping the thumb-rest, and the handle is resting on the fleshy area above your forefinger (see video for clear demonstration). Tip: When first learning how to hold a crochet hook your hands can become cramped if you don't have the right grip, so keep adjusting and try different methods until the hook feels right in your hand. Remember there is no set rule to holding a hook and you really need to find what works for you. 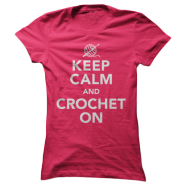 Please join me for Lesson #3: "How to Hold Yarn for Crochet"